So here is the anniversary dinner dress. I am very happy with how it came out. My husband said it looked very elegant. Pattern Description: "Who could resist this dramatic plunging back neckline and slinky shape" It's made in stretchy floral fabric for a perfect fit"
Pattern Sizing: The pattern is available in sizes 36-44. I made a 42; which is about a size 16 in the big 4. Did it look like the photo/drawing on the pattern envelope once you were done sewing with it? Yes it did! Were the instructions easy to follow? Things were going along flawlessly until I got to the part on how to attach the bodice lining to the dress. I just didn't have the brain capacity to picture what they wanted me to do. So I went to plan B: search through my big four patterns with a similar construction. 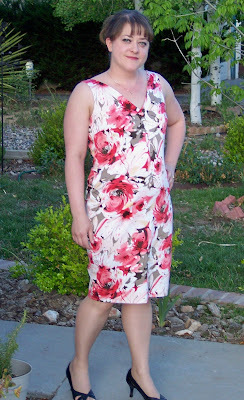 I found a pattern for a dress I have made before and reviewed here. . I totally ripped off the instructions from that dress and they worked perfectly for this dress. See detailed instructions below. What did you particularly like or dislike about the pattern? What drew me to this pattern was the unexpected back plunging v-neck. I also like all of the darts- there is 6 darts in front. It really creates a nice shape and fitted look. I also like that the bodice is lined instead of doing facing. Wearing a bra with this dress can be challenging. You can get one of those sticky, backless bras. Or you can sew in bra cups as Susan suggested. I might still do that but I wore this out to dinner with my husband and got away with no bra (I'm a B cup). Fabric Used: Stretch cotton from Joann Fabrics. It's a coral floral print and cost me $18. I also used an invisible zipper. I found that the zipper was needed in my dress. The fabric had stretch but not enough to not have the zipper. 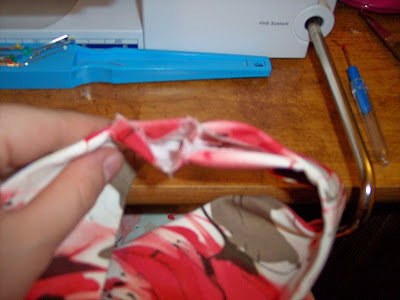 Pattern alterations or any design changes you made: I didn't change anything except how I attached the bodice lining. I didn't make a muslin first (I know, shame on me). If I had, I might have shortened the shoulder straps just a tad in the front and back. Other than that- it was a form fitting sheath that fit well. Also- this dress was a little narrow to walk in- it might benefit from a back walking vent. Would you sew it again? Would you recommend it to others? I probably won't sew this one again but I would recommend it. It went together very quickly. I made this the day before my anniversary dinner with my husband. Conclusion: Very nice dress with a great shape. Love the back neckline! Here is how I constructed the dress. -Darts: Complete the front darts first. Sew the vertical dart and press to one side. Then sew the horizontal dart, pressing down. Sew the bust darts, pressing down. 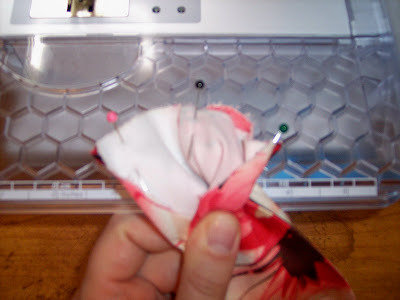 Sew the curved darts, pressing to the center (the curved darts were tricky- use lots of pins!). After applying interfacing to the front facing, sew the darts in just as above. Stitch the darts in the upper and lower back pieces, pressing darts up. 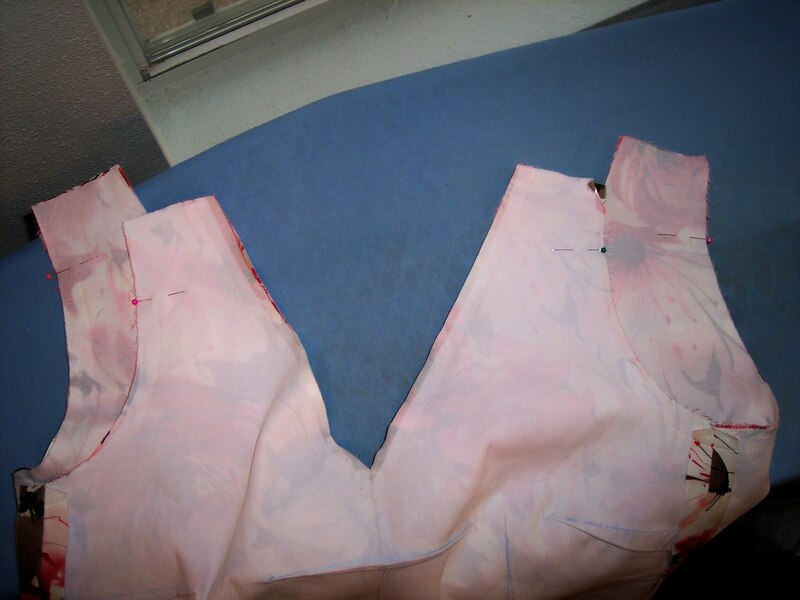 After applying interfacing to the upper back facing, sew the darts in just as above. -Stitch the upper back to the lower back, press seams up. -Insert the invisible zipper in back center seam. Stitch the center seam below the zipper. 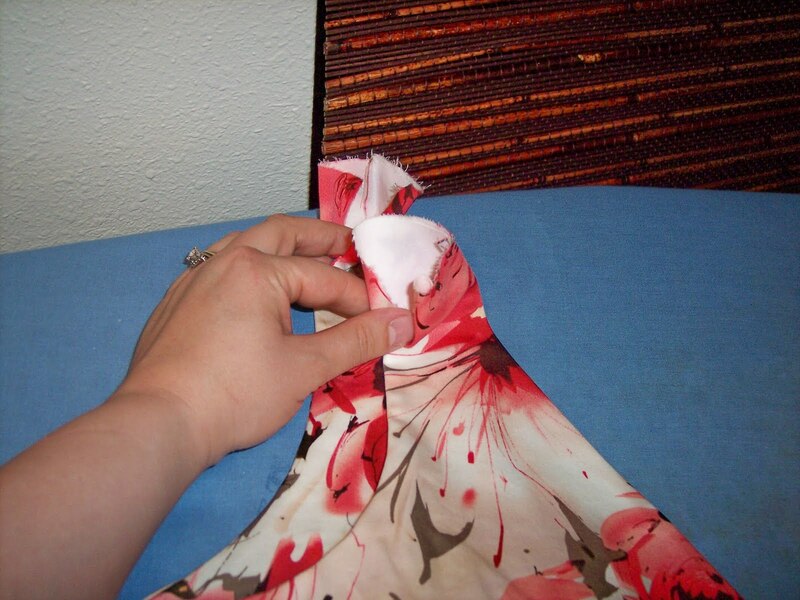 -Stitch the front a back dress together at sides. -Stitch the front and back facing pieces together at the sides. Finish the lower edge of the facing section. I used a zigzag stitch. Because the dress is so form fitting, I would not recommend folding and stitching the lower edge or applying bias tape. This would create a ridge that might show from the front. - Pin facing to dress, right sides together. -Stitch front and back neck edges. -Trim seam allowances and clip curves. -After trimming and pressing the shoulder seams, turn them back in. Press in your seam allowance along the armhole edge and slip stitch in place. -Slip stitch the back facing to the zipper along the back center seam after turning in your seam allowance. -Finally, turn up hem and sew in place. I love it! I thought mine came out nice, but yours is so delicious. Perfect for your anniversary celebration. . Very elegant! You look so beautiful in it. Gorgeous. You look beautiful in the dress. Happy anniversary! 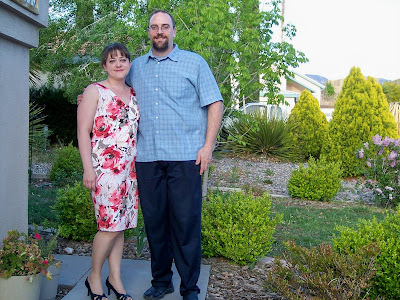 You did a beautiful job on this dress for your anniversary. LOVE IT!!! Beautiful dress! I didn't get around to making it for this past weekend... but I will for my brother's high school graduation. :) I love that print! It looks gorgeous! Congrats on the anniversary. this is a gorgeous dress. i love the floral print and the low back.